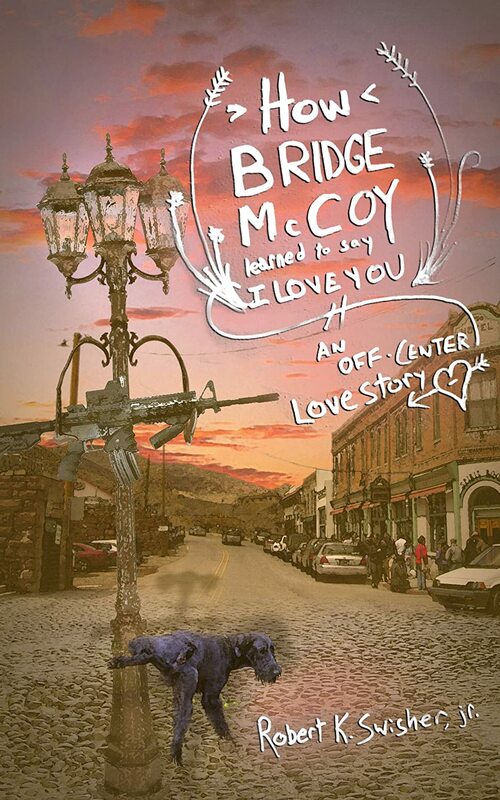 HOW BRIDGE MCCOY LEARNED TO SAY I LOVE YOU is an off the wall love story about a man who walks two steps forward and then one backward that when he tries to tell the woman he loves that he loves her he starts choking like there is a meatball stuck in his throat. Set in a small art town in New Mexico the novel is alive with a cast of characters that your mother tried to warn you about – besides a man who walks two steps forward and one backward there is blind painter that has three personalities and spends his time arguing with himself over politics, a lady that believes there is a rock of rocks that will guide her to enlightenment, 200 dogs that are tired of eating vegetarian dog treats, gays, straights, and in-betweens, a lady that is so happy bubbles follow her around, lampposts that moved to a commune, old streets that proclaim pot holes are worse than toothaches, homeless people that want take home bags renamed, and many many more that verge on the edge of what is real and what is not. A look at our insane modern world by people that enjoy being on the fringe. The novel will make you laugh, think, shed a few tears, and hopefully lighten your load. 16 traditionally published novels and 7 indied – they range from young adult, poetry, historical fiction, to humor.